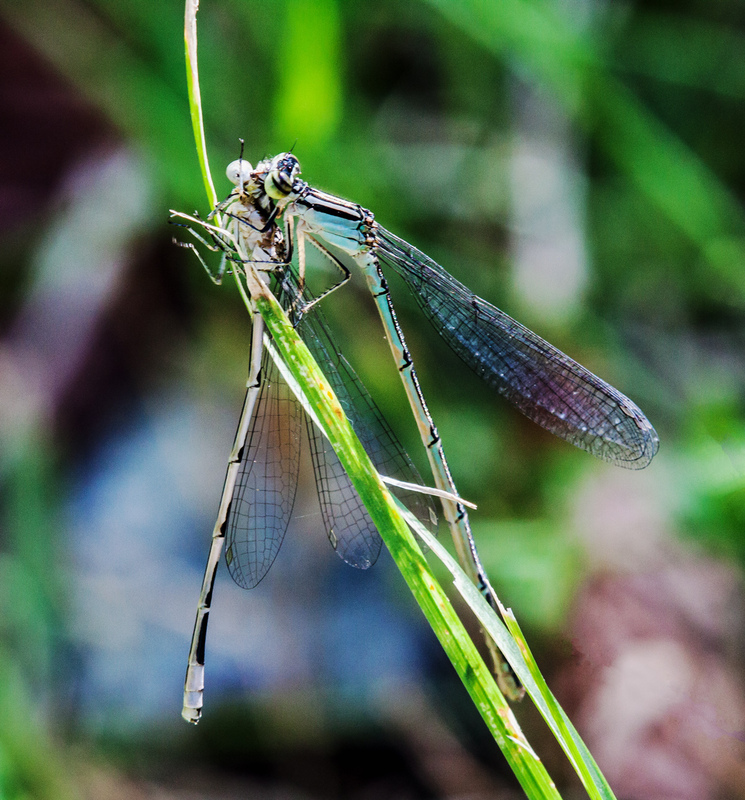 When recently at Occoquan Bay National Wildlife Refuge I spotted these two damselflies, which an expert identified as probable Big Bluets (Enallagma durum), I initially thought they were mating. Then I realized that the positions were all wrong and the nibbling on the neck was probably indicative of a literal hunger. Yikes. 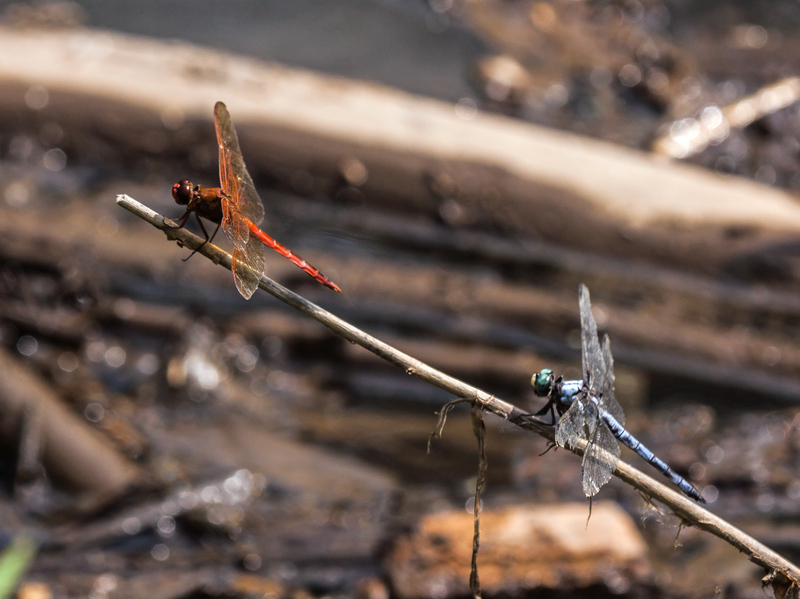 Two different colored dragonflies, a Needham’s Skimmer (Libellula needhami) and a Great Blue Skimmer (Libellula vibrans), were peacefully sharing a prime perch on Monday at Occoquan Bay National Wildlife Refuge. Why is it so hard for us to peacefully coexist with one another? Have you ever gotten into a staring contest with a dragonfly? 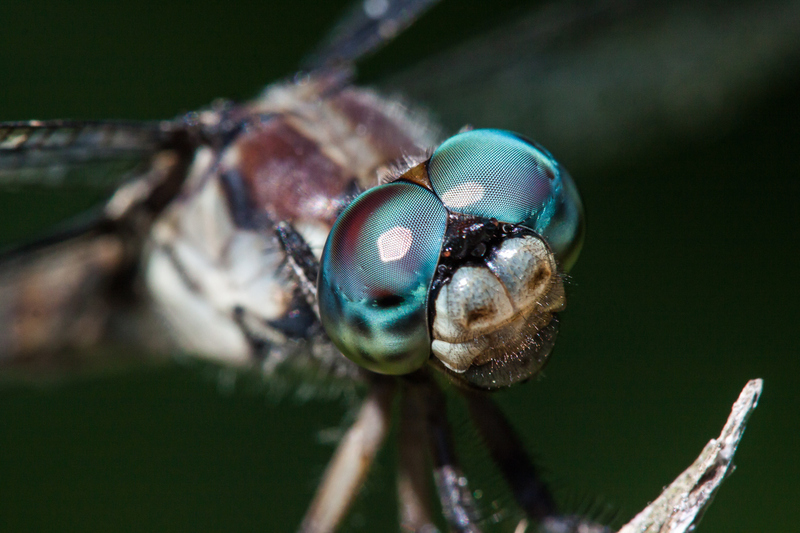 Dragonfly eyes can have an almost hypnotic effect on you when you look directly into them.. I went eye-to-eye with this Eastern Pondhawk dragonfly (Erythemis simplicicollis) on Monday at Occoquan Bay National Wildlife Refuge. She was the one to break eye contact first as she cocked her head, smiled at me, and decided the contest was over. 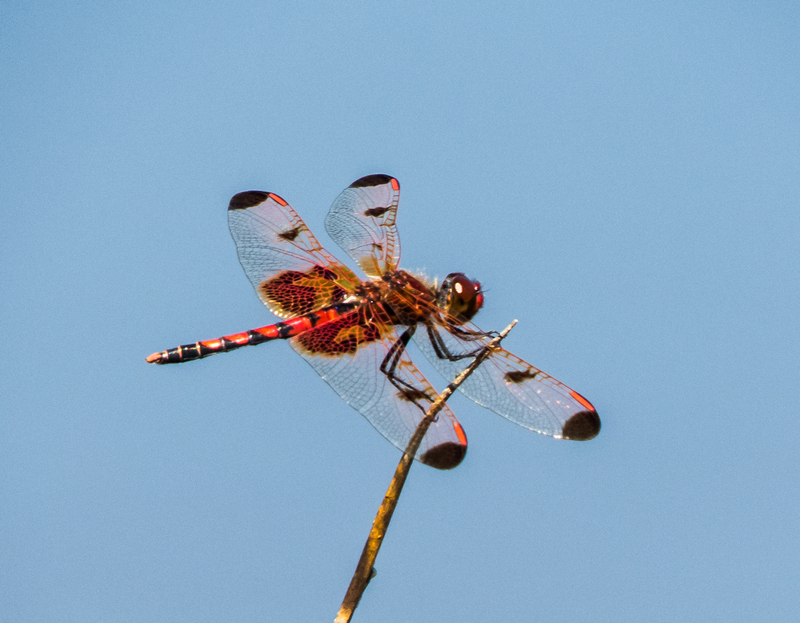 It is great to see that at least a few colorful Calico Pennant dragonflies (Celithemis elisa) are still around. I photographed this handsome male last Friday as he perched at water’s edge at the small pond at Occoquan Bay National Wildlife Refuge. Summer is slowly slipping away. 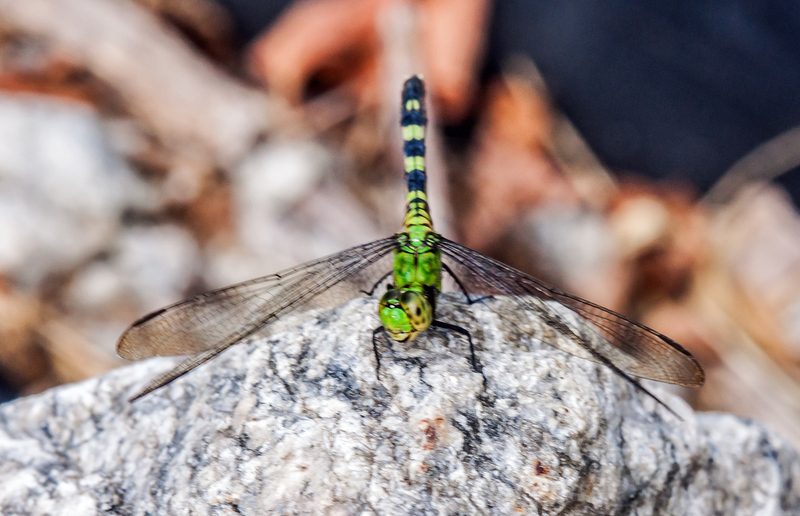 Some species of dragonflies are already gone for the year and others will soon follow suit. A few species have yet to appear, so all of the news is not bad. Still, as kids return to school and the daylight hours become noticeably shorter, it’s hard not to have the feeling that the lazy days of summer are coming to a close. Autumn is my favorite season for a number of different reasons, but I am not quite ready to give up on summer. So I’ll keep sweating and searching, seeking to capture the summer beauty that still surrounds us. Like this dragonfly, I’m still holding on. 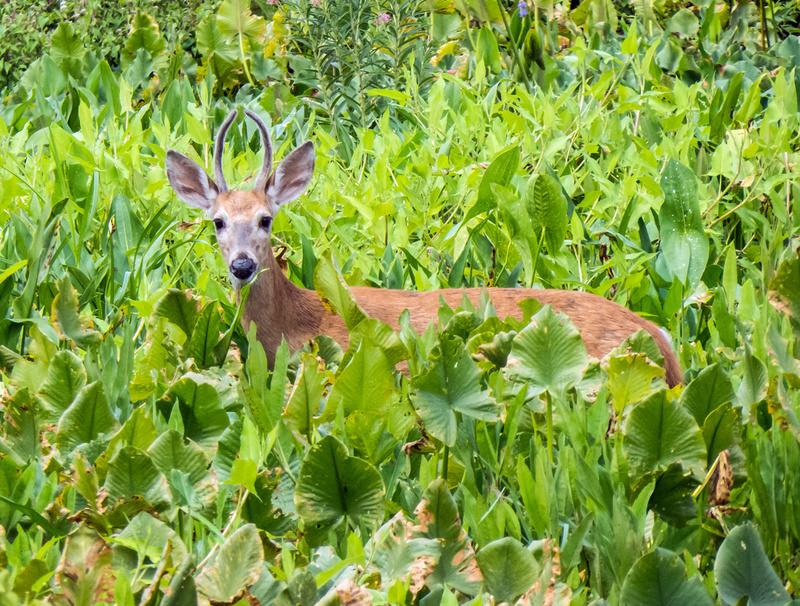 This little buck seemed more curious than fearful when he spotted me on Monday at Occoquan Bay National Wildlife Refuge. He continued to forage in a marshy area for a while before he finally disappeared from sight. I know that we have a herd of White-tailed Deer (Odocoileus virginianus) on the wildlife refuge, though I see deer only on rare occasions. This little deer seemed to be alone and I was really struck by the shape of his antlers. It looks to me like they might be his first set of antlers, though I confess to knowing almost nothing about the stages of development of a deer. The shape of the antlers reminds me of photos that I have seen of several species of antelope in Africa. 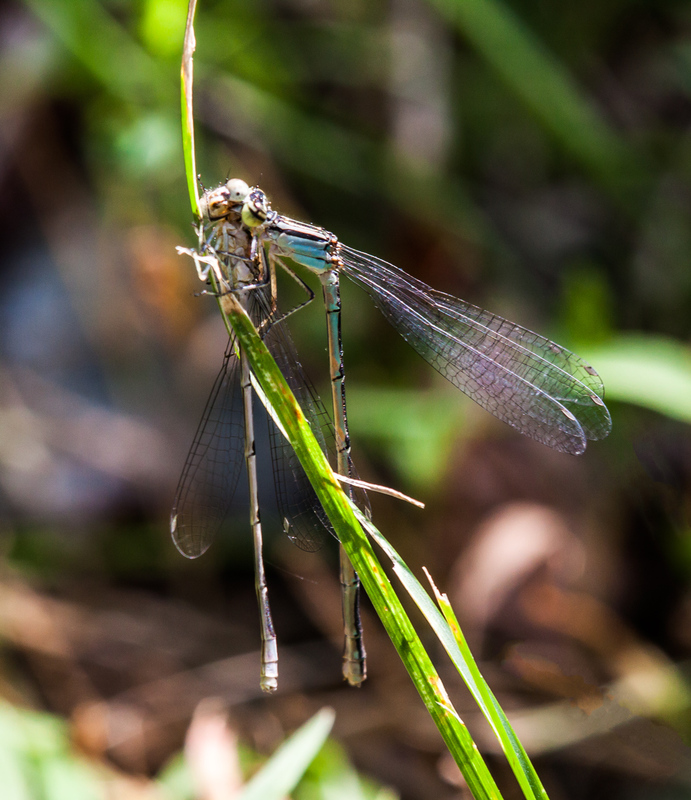 Dragonflies have amazing compound eyes that wrap around their heads. 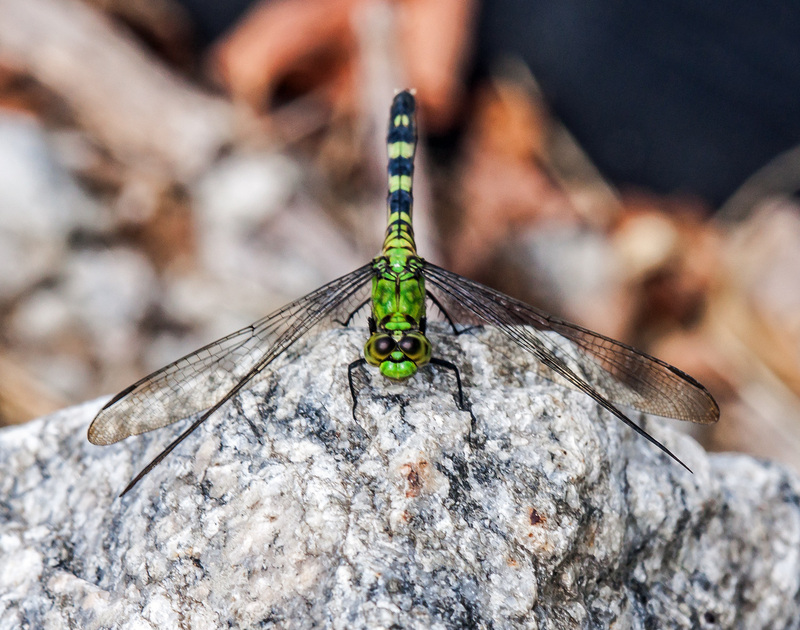 With up to 30,000 facets (ommatidia, to be technical), dragonflies have incredible vision and can even see colors beyond human visual capabilities, like UV light. For an easy to read discussion about dragonfly eyes, i.e. not overly scientific, check out this posting by “grrl Scientist” that was posted on scienceblogs.com. I captured this close-up image of a Great Blue Skimmer dragonfly (Libellula vibrans) yesterday at Occoquan Bay National Wildlife Refuge. At least once a season, I manage to get a shot like this when a cooperative dragonfly lets me get close. 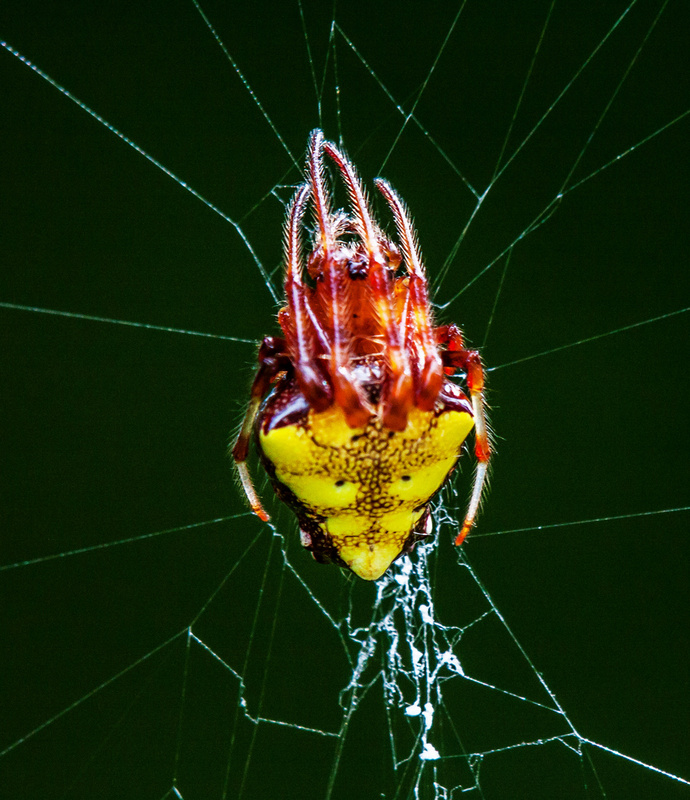 I captured the image below with my trusty Tamron 180mm macro lens on my Canon 50D DSLR. This lens, which has a longer focal length than most macro lenses, gives me some stand-off distance so I can get a macro shot like this without actually being on top of the subject. The only downside to the lens is that it has no built-in image stabilization, so I have to pay extra attention to remaining steady when shooting with it—I generally use a monopod to help reduce camera shake and I think it helped for this image. The image is framed just as I saw it in my viewfinder. Most of the time I end up cropping my images as part of my normal post-processing, but in this case it looked pretty good without any cropping whatsoever.